Take part in our award-winning summer STEM (Science, Technology, Engineering, Math) teen academic programs. Gifted students will engage in experimental research & take exciting field trips. Includes Biological, Chemistry, Biomedical, Engineering, Psychology, Neuroscience, and STEM Entrepreneurship. Emergency Medicine - Areas of focus include toxicology, resuscitation, and trauma, and our instructor will arrange mock scenes ranging from drug overdoses to frostbite to car accidents. Students will also practice CPR on CPR dolls, study injury prevention, and learn how to take a patient's vital signs. Additionally, throughout the course, students will brainstorm and work on personal research projects concerning hot button topics in the world of emergency medicine. They will present their work to the group at the end of the three weeks. Anatomy and Surgical Research - Students will learn about the different systems of the human body which may include nervous, skeletal, circulatory, muscular, digestive, lymphatic, and endocrine while also studying surgical techniques such as knot-tying. They will learn through case studies, hands-on dissections, field trips and classroom lectures. Biomedical and Surgical Research - Lectures and activities showcase the anatomy of systems such as the heart and circulatory system. Case studies and lectures are used to overview both emergency room and planned surgical procedures for that system. In the laboratory, students learn how to tie surgical knots as well as suture incisions on models of skin. Students apply these newly learned skills to complete mock surgeries that mimic various real-world surgical procedures. Biomedical Research: Contagious Diseases - Students will explore the nature of many of pathogens and discuss their transmission, prevention and treatment. Specific focus will be on HIV infection, influenza and cholera, but attention will also be given to additional viral, bacterial and parasitic infections. Lab investigations will explore basic microbiological techniques as well as demonstrate several of the diagnostic tools used to confirm infection. Biomedical Research: Genetics and Clinical Trials - Students will be introduced to the recent advances in genetics, genetic testing and personal genome sequencing, and will be presented with some of the decisions and ethical challenges an individual may face regarding the use of this technology. Students will also learn about some of the likely benefits of personal genetics, such as gaining the ability to act on one's genetic risks, tailoring medicines and interventions, and becoming more active and engaged healthcare consumers. Veterinary Medicine - This program will focus on veterinary surgery, bone-setting, and the modern veterinary environment. Students will also explore various methods of diagnosis, including how to detect pain in an animal and how to analyze X-rays and MRIs. 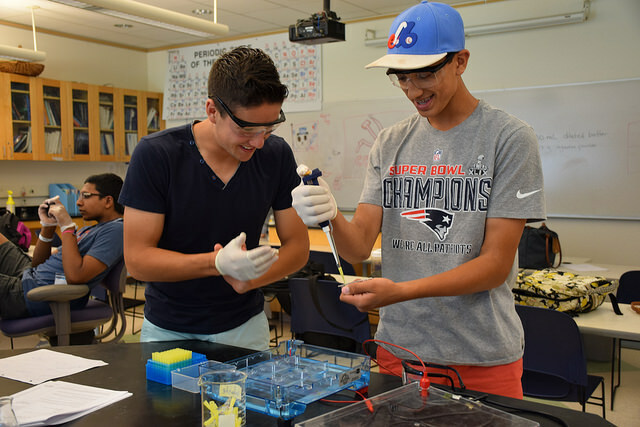 Biological Research - Students conduct biological research and explore the extremely hot topic of synthetic biology in this award-winning summer pre-college program. Synthetic Biology is a new and exciting field in which engineers design genetic systems that can improve people’s lives. Synthetic biologists are designing bacteria that can detect poisons, respond to light in different ways, and contain genetic circuits that can “compute." 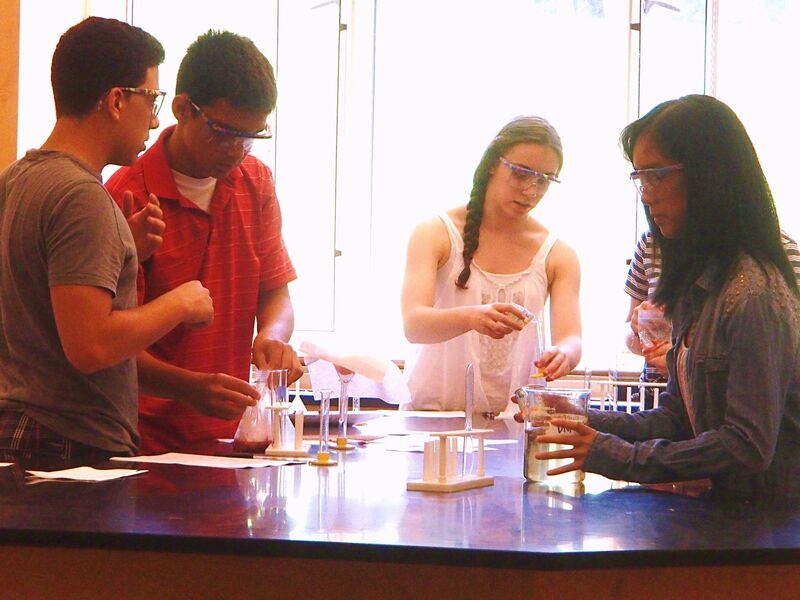 Our teens enjoy amazing hands-on labs (including analyzing DNA and inserting genes into bacteria) and in-depth research in a beautiful science lab setting. Human Genetics - This course serves to introduce students to the modern breakthroughs of genetics in an engaging and approachable manner. Topics discussed will include inheritance, the cell cycle, evolution, immunology, microbiology, and sexual reproduction. Students throughout the course will participate in a final Genetics Counselor Project, which will require extensive study of a genetic disorder of their choice. A visit from a genetics counselor will facilitate student learning through contextualization. This project culminates in a symposium, in which students present their projects in front of the class and then answer questions about the genetic disorder they researched. Mars Mission - On this mission to Mars, students will design how we getthere, how we land, how we survive once we are there, andif we are very lucky, how we get back to Earth... for thosewho wish to do so. Design rockets that can reach Mars with a PhD physicist from Harvard who has been on a simulated Mars Mission (see photo of him on bottom left). Review data with him on the effects of radiation--that astronauts are exposed to on their journey through space--on human health and genetic mutations. Use 'Mars-like' soil (pictured below) to plant vegetables in a temperature controlled green house and assess how they would survive on the red planet. STEM Entrepreneurship - Many of the world's greatest tech companies, including Dell, Apple, Facebook, and Microsoft were founded by kids not much older than the teens who come to our programs. The Boston/Cambridge area has the highest amount of venture capital funding in the US outside the greater Silicon Valley area and the highest concentration of biotech companies in the US. Students will participate in brainstorming sessions to generate ideas for improving the way that local companies do business. Students also will develop a plan for their own revenue-generating business or a small money-producing venture. Chemistry Research - Green chemistry, also known as sustainable chemistry, is the practice of designing materials using processes that reduce or eliminate the production of hazardous materials. Throughout this program, students will explore the 12 Principles of Green Chemistry and learn how this philosophy is changing the culture in chemical research and industry. This course focuses on practical applications of chemistry theory, such as safety and toxicity analysis of products, application of biomimicry to material and product development, and biodiesel synthesis from vegetable oil. Clinical Psychology and Psychiatry Research - Students will gain an understanding of the major forms of mental disorders including: Autism, Schizophrenia, Phobias, Obsessive-Compulsive Disorder, Post-Traumatic Stress Disorder (PTSD), Depression, Eating Disorders, and Attention Deficit/Hyperactivity. Students will learn about the specific defining characteristics of the different disorders, physical and facial markers (where relevant), and social and emotional corollaries. Case histories, film clips, and visual aids will be used in addition to lectures to impart understanding of the basic forms of mental disorders. Students may also take a field trip to a psychiatric treatment facility and to an academic lab to learn about recent psychiatric research. Engineering Research - Students will learn computer programming, mechanical engineering, and electronic engineering principles, by working through several hands-on projects. The main project involves a robotic sailboat. After learning the basics of sailing, students will program and sail instrumented radio-control sailboats according to algorithms that they create. Students will then sail and conduct experimental research on the robotic sailboats. For the electronics design project students will build a portable stereo speaker set with custom-designed packaging. On the steam-boat project students will design a boat to hold a small steam engine that they build and refine. Biotech & Pharma - Students will follow the process of drug discovery from selection of targets to identification of a lead compound and onward through lead optimization and pre-clinical trials. The pharmacology portion of the program is great for those who are interested in pursuing a career in medicine, pharmacology, or biotech/chemistry research. Students will learn basic principles of computational chemistry and use computer models to identify and test characteristics of new drug candidates. Biomedical Engineering - This course will provide students with a strong knowledge of the fundamental biology required for the development of medical technologies. starting with genetics and how biology engineers itself from cells to complex tissues (via biochemistry); then, materials chemistry to understand the components available to engineers for replicating these structures. Many of the labs are open-ended and promote critical thinking skills. Students will work with DNA via extraction and transformation into bacteria, as well as 3D design and 3D printing. In addition, student will discuss the ethics and societal implications of biomedical engineering. Applied Physics and Engineering - This hands-on program, designed for students who are preparing to take high school Physics or have already completed it, covers critical laws of flight, gravity, and motion. 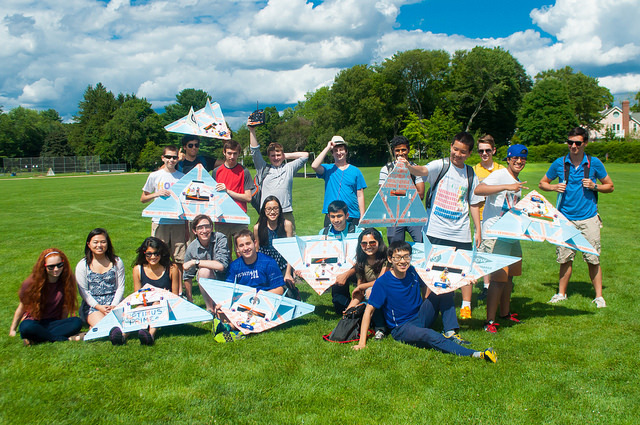 Students construct and test model airplanes while examining thrust, lift, drag, and weight under varying conditions. During their experiments, they will also explore the ways in which ailerons, elevators, rudders, and flaps affect a plane's stability. Many lectures and exercises will center around acceleration, centripetal force, and g-force. Engineering: Electronics and Robotics - Students will employ principles of mechanical engineering, electrical engineering, and computer science while designing and assembling robotics vehicles and machines. They will then write computer code to operate their creations. Students' designs will be sophisticated enough to pass challenges that they students assign to them, such as reacting to sound or finding and retrieving objects. They might even climb up hills or navigate and obstacle course! This allows students to be creative while also engaging in exploratory work in engineering. This year, students will be attending the MIT Edgerton Center and the MIT Museum. Architecture - Students with a passion for design, structure, and space are a perfect fit for our new Architecture course. From drawing up a plan to constructing a model, our young architects will learn how it feels to contribute to a city’s skyline. Clinical Psychology - Students will gain understanding of the major forms of mental disorders such as: Autism, Schizophrenia, Phobias, Obsessive Compulsive Disorder, Post Traumatic Stress Disorder (PTSD), Depression, Eating Disorders, and Attention Deficit/Hyperactivity. Students will also gain understanding of interventions and treatment options. Intro to Dentistry - Students will be introduced to the dental school environment and explore the career opportunities available. The program includes hands-on activities in simulation labs and trips to observe dental care in a clinical setting. Oncology - This program will provide great exposure for the next generation of scientists who are considering a cancer research related career in the future. Boston, one of the medical capitals of the world, is home to the Dana-Farber Cancer Institute, which is one of the best and most comprehensive cancer treatment and research centers. Sports Medicine - Some of the topics covered in this week-long course include physical therapy, surgery, orthopedics, concussion research, and much more. Students will receive hands-on experiences learning about a variety of advanced techniques on rehabilitation and performance. Anatomy - Students will be taken on a journey of discovery into the marvels of the awe inspiring human body. Our work will include hands-on lab activities, discussions, and a field trip. Contagion - Students will explore the diseases that have shaped the past and continue to shape the world of medicine today. They will simulate disease transmission and learn the history of epidemiology through hands-on lab work and concrete examples. Intro to Surgery - This program will present students with basic surgical skills, such as surgical knot tying and suturing, and then allow them to translate these skills to mock surgeries. Cardiovascular diseases and surgical procedures will be focused on this week, including coronary artery bypass grafting. Marine Biology - This one week course will provide students with foundational knowledge of the biology and ecology of marine ecosystems, with a specific focus on the methods that scientists use to study marine habitats. The program will include several field trips that will vary based on the tides and ocean conditions. Forensics - This is a chance for students to delve into a subject they don’t see in school! Perfect for those who are interested in Anatomy and Biology, no other course combines these topics as well as Forensics. This course includes a lesson in facial reconstruction software and fingerprinting. Physics of Space - This course offers an exciting look into the fundamental physics of the universe, covering cutting edge topics such as black holes, dark matter, neutrinos, and the "God" particle. Students will learn how to manipulate the massive amounts of data coming in from NASA and other space research institutions. Big Data - In this course, students will be introduced to some of the core principles of Big Data. Students may learn techniques related to controlling the costs and benefits of information processing. The course may focus on elements such as decision-making, data structure and analytical models. Finance - Students will be exposed to the mathematical concepts and techniques used in finance and how to apply them to financial markets such as the stock market. This course may cover bond valuation, stock valuation, dividends, developing forecasts, spotting trends, options/pricing, cash flow, seasonality and trend. Real Estate Statistics - Bring math and applied statistics to life while studying one of the most lucrative career paths – luxury real estate and investment. Wendy Fox, the Vice President of Coldwell Bankers in Weston, MA and former Director of Marketing at Platinum Magazine, will teach students how to utilize trends, location, and investment techniques to reach the top of the real estate game. Sports Statistics - This class combines the study of statistics with the fun of sports. Students will learn about fundamental statistical measures and will also extend their knowledge of secondary math through the use of graphing calculators. While baseball, with its wealth of data, figures most prominently in our work, students are encouraged to bring their interest in other sports to the session. Included will be a trip to Fenway Park to see the Red Sox play as well as another sports-related excursion. 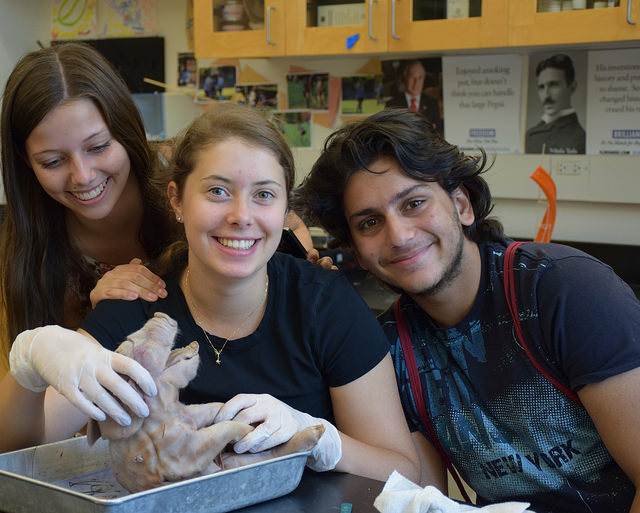 AP Biology Edge - This one-week program will prep you before classes even start. Our goal is to provide early exposure to the most difficult topics, thus preparing you to succeed on the AP exam later in the year. AP Calculus AB Edge - AP Calculus AB is a rigorous, college-level course, but is also one of the most popular AP courses. If you like to get ahead, this is the perfect one-week program for you. Chemistry Edge - Chemistry topics to be covered will include algebraic manipulation, dimensional analysis, identifying common sources of error, atomic structure, the design of periodic table, formula writing and naming compounds, and basic problem solving in chemistry. Ideal for those taking Chemistry this fall or in upcoming years. Geometry Edge - Get a jump on proofs, theorems, and topology in this one-week Geometry course. An introduction to the most creative subset of high school math, this course helps students get an edge on the material before reaching it in school. Physics Edge - Some of the most challenging concepts will be previewed in lectures and principles will be illustrated in experiments. Great for students looking for that edge to help them excel in their fall Physics courses. Intro to Biotech - This one-week program is for students interested in understanding the process of drug discovery and development in the pharmaceutical and biotech industry. Students learn Synthetic Chemistry techniques through hands-on synthesis of a simple drug molecule, its isolation, and purification. We have one and three week program options. Our programs will run starting the week of June 17 through the week of August 5. There are really three components to this program, like many other away-from-home summer programs: academics, campus and dormitories, and leisure. Then, my final thoughts. Academics: I had Rich Fox for forensic pathology for three weeks, and the takeaway as a student is "Wow". There were roughly a dozen in our class, so if there were any issues or suggestions as to the direction of the course (which projects the students thought interesting, particularly), you would not go unheard. Mr. Fox very much knows how to utilize his time and marshal his resources appropriately as we examined live (and dead) insects; cast our own dental, shoe, and finger impressions; and watched Forensic Files with notes pertinent to the forensics topic of the day (and much, much more). With his connections he accessed us to the Boston Police Headquarters through its ballistics, fingerprinting, and DNA labs, as well as the Harvard Museums' art forensics labs--both very enlightening experiences. He, in other words, was never without the sort of passions and commitments of a true teacher. Campus and dormitories: I'm not one to complain much, but in the dog-days of summer where 90-to-100-degree heat is not atypical, air conditioning in Simmons Hall was absent. Though it was unfortunate that (to my knowledge) it was the only hall not to have AC, it was met at some displeasure that the hallways themselves were hotter that the beautiful and gated (safe) campus grounds. The cafeteria food is average, but board and card games, a BBQ, a gym and swimming pool, and ice-breakers made dorming there at times much easier. Leisure: There is ample and mostly non-mandatory (though highly recommended!) activities on the afternoons and weekends. Trips to the neighborhoods (accessible by the T (subway) or bus) such as Chinatown, the North and South Ends, and Fenway-Kenmore's Fenway Park, and to museums such as the Isabella Stewart Gardner and the Museum of Fine Arts, quite within walking distance. North up the College's adjacent Brookline Avenue are a multitude of restaurants, a Target, a movie theater, and the nearby train/subway station. All events are scheduled by personable counselors (given enough people) and are reasonable and caring with and for the students. Final thoughts: BLI, like many other STEM summer programs, is what you make of it. If you don't do any work in the day, stay in the cafeteria in the afternoons, and rest at an early bedtime without exposure to the Bostonian culture, then it's largely not the program's fault for your displeasure. But, for many of us including myself: if you find adequate interest and invest the needed time in your STEM projects, explore the local shops and stores with friends in the afternoons, and immerse yourself in the activities provided amply by the counselors in the evenings, then Boston Leadership Institute will certainly be met, as it largely has been, with high regards. Great news! ALL dorms will be air-conditioned for Summer 2017. BLI is a beyond this world experience. I did the Biological Research program and lived in the dorms. Dana hall a beautiful campus to stay in, with numerous activities such as tennis, soccer, lacrosse and an Olympic pool. The program itself is a a very valuable learning experience. How it worked was that we would have fascinating lectures on recent biotechnology innovations in the morning and we would do lab work during the afternoon. The lab work is great because it gives you real experience on lab procedures such as gel electrophoresis which is equivalent to gold when looking for internships or work in the field. The most interesting part however, was the research projects. We got the opportunity to think up our own GMOs based on facts. Throughout the three weeks you can work on the project with extremely supportive and enthusiastic staff, who answer all your questions and even inspire you to reach further. Overall, the program is awesome and worth every penny. I also made a lot of friends there that I still stay in touch with today, so I have quite a collection of wonderful memories. As a relatively high-achieving student in my junior year of high school, I decided it would be best for me to spend my summer enriching my knowledge base in order to perform, as a true intellectual, better. What other place for me but Boston Leadership Institute? Dana Hall, set on a campus that is right by a campus that is home to one of America's top colleges (for women), boasts what one could expect from a prestigious, all-girls boarding school: fully-stocked high school labs with a chemical storage room set squarely in between a small auditorium and a lecture hall (both used for summer children's plays and all unlocked), paths, and grass. Endless opportunity for all who desire awaits the attendees of BLI and my personal experiences here lead me to advise you not to defer your decision to apply any longer. The Boston Leadership Institute is a great program, and it gave me a new perspective with what I want to do as a major for college. I learned a lot of new information, and techniques which will help me in the future. The teachers are great, and people are friendly. By going to The Boston Leadership Institute program, you can meet people from all over, America, the world. My time at BLI was great, and I recommend it to anybody who is interested in STEM. "The program was very interesting and engaging and I learned a lot in a short period of time. The teacher was very knowledgeable and rehearsed and could answer all of our questions." "I learned so much from this program that I wouldn't have been able to accomplish without it. I learned key lab techniques and performed labs that will prove to be extremely useful in the future." "I liked the experience I got being around many other people similar to me but from all different parts of the world. I also loved the class as I improved both my presentation skills and my knowledge and view of the medical field." Want More Information about Boston Leadership Institute: STEM (Science, Technology, Engineering, Math) Summer Programs? Your request will be sent directly to Boston Leadership Institute. By submitting this form I confirm that I am at least 13 years of age and give my consent to be contacted by Boston Leadership Institute by email as well as by phone and/or mail (if provided).